Coil each garlic scape and insert into a sterilized mason or ball jar. When you have filled the jar to within 1/4 –inch of the top of the jar, coil or break any extra scapes and stuff them down into the center of the jar. When the jars are full of scapes, add the spices to each pint jar. Set aside. Bring the apple cider vinegar, water, salt, and sugar to a boil, stirring until the salt and sugar are dissolved. Carefully pour the boiling brine over the garlic scapes. The garlic scapes will probably pop up and look like they are trying to get out of the jar. Use a sterile chopstick or butterknife to push it back into the jar. Wipe the rims of the jars, then fix the lid tightly into place. Let the jars come to room temperature before storing in the refrigerator for 6 weeks before opening and tasting. Be patient. It’s worth it! 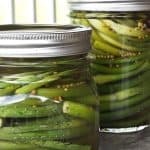 The pickled garlic scapes will store well for up to 8 months when stored tightly covered in the refrigerator. If at any point the scapes stick above the brine and develop mold, remove the entire scape that has mold. The rest should still be alright.